Allen Conway's Blog: It's Visual Studio LIVE Eve! I pumped and excited for another great year at Visual Studio LIVE! I'm attending the 2012 conference here in sunny Orlando, Florida which is a great selection based on the cold, rainy weather I see around the rest of the country. It's my 5th Visual Studio LIVE! conference, and I can say it has been a HUGE contributor to my DNA makeup as a software developer over the years. I noticed this year the conference has expanded back out to Visual Studio LIVE!, SharePoint LIVE!, SQL Server LIVE!, and Cloud & Virtualization LIVE! 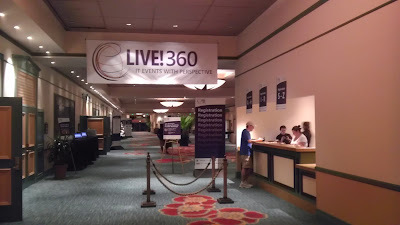 The last time I saw the conference segregated out like that was in 2007 in Vegas when it was the old TechMentor and VSLive! conferences. Nice to see the conference is back in full swing and there are going to be a boatload of talented folks from all over the country attending. Another great part of this conference is networking with elite developers and the like to get a litmus on the industry and what people are using, found not good to use, and overall direction on the Microsoft stack. I've already registered tonight and getting ready for a full day workshop tomorrow on WCF and Web API with Miguel Castro. I've always been a fan of programming services and enjoy them a lot so tomorrow should be both fun and intriguing to continue my knowledge push on these technologies and best practices. All right, it's almost that time so here we go! !